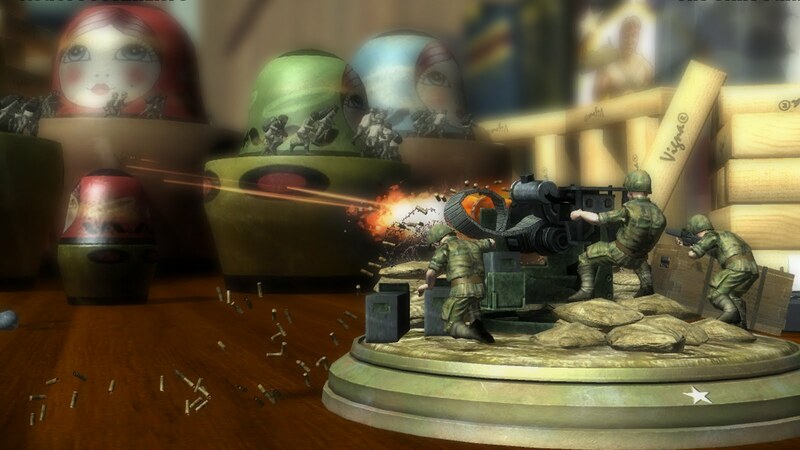 Toy Soldiers hit the Xbox Live Marketplace last year, and was a huge success. A mix of strategy, tower defence and vehicular combat, it had something for everyone. So how can the sequel, Cold War, improve on the stellar original? The first difference is that the game isn't set in the World War. This time we are taken to the toy world of the 80s. Improved weaponry, vehicles and action figures are all here, and the hair style that defined the decade also makes an appearance; the mullet. The attention to detail is fantastic. The maps are littered with Rubik's cubes and Jenga blogs and the music could be from Top Gun. Signal Studios really know how to draw you into their game's world. The second new addition is the Attack Barrage. Get a big enough multiplier (by stringing enemy kills together quickly), and you'll get a random special attack, or a barrage. These include artillery fire and close air support, but the best one by far is the Commando action figure. Looking like Rambo, you can run anywhere on the map and have unlimited ammo in both your machine gun and rocket launcher. These barrage powers can really turn the tide of the battle and they're a great addition to the series. Cold War has a much faster pace than it's predecessor, and really does feel like an over the top action movie. Explosions, silly amounts of bullets and a hell of a lot of enemies can be on screen at any one time. Get enough kills and you enter Turbocharge mode, which gives you unlimited ammo and an immense sense of satisfaction as you mow down entire battalions. Players of the first Toy Soldiers will have an advantage, as the gameplay is very similar. The same methods for placing, upgrading, repairing and selling weapons are used, so it should be easy to get to grips with. The vehicles are back too; tanks and planes are available on select levels. This time around though, you can also pilot attack helicopters, with missiles and machine guns, with much greater accuracy than the planes. There are some mini games in Cold War, which are so much fun. Whether it's taking down flies with anti aircraft weapons or guiding a missile through rotating doorways in a neon tunnel, you will have a good time. They are incredibly varied and provide a nice break from the campaign mode. 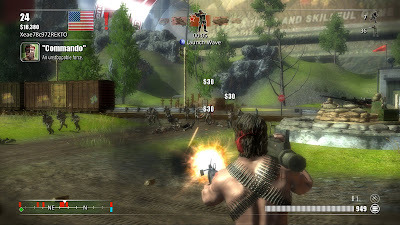 Other modes include survival, versus and coop, both online and local. 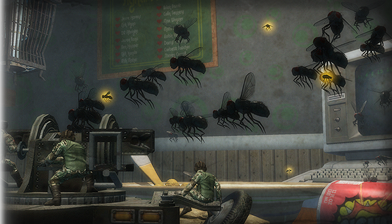 Take down the flies with AA guns! With even more over the top gameplay, action and weaponry than the original, Cold War takes the series to dizzying heights of awesome. The soundtrack is quintessentially 80s and the sound effects are brash and loud. Toy Soldiers: Cold War has done what many sequels fail to. Not only is at as good as the original, but it is better. Faster, louder and with a better sense of humour, Cold War really outdoes it's predecessor in almost every department. Don't miss this game. Toy Soldiers: Cold War is available August 17th, for 1200 MSP.